High Quality Content by WIKIPEDIA articles! High Quality Content by WIKIPEDIA articles! The Yamartino method is an algorithm for calculating an approximation to the standard deviation of wind direction during a single pass through the incoming data. 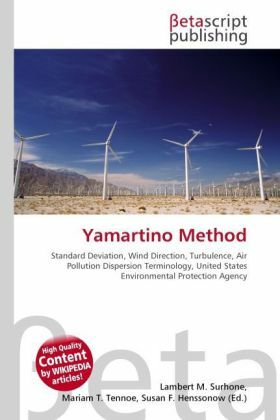 The standard deviation of wind direction is a measure of lateral turbulence, and is used in a method for estimating the Pasquill stability category. The typical method for calculating standard deviation requires two passes through the list of values. The first pass determines the average of those values; the second pass determines the sum of the squared differences between the values and the average. This double-pass method requires access to all values, and special consideration must be made for a discontinuous variable such as wind direction.